If you want to be productive on your iPhone or iPad, you need a good office suite. 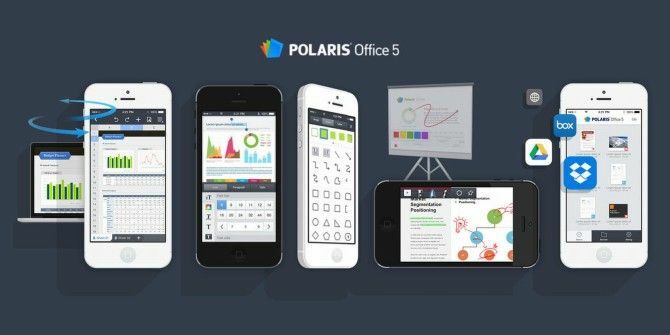 Polaris Office 5 promises to be just that, with plenty of powerful document editing features, Microsoft Office compatibility, and a faster document loading speed. And it’s not too bad on the eyes either. Could this be the first office productivity suite to make it to our list of the best iPhone apps? Polaris Office 5 touts its compatibility with MS Office documents more than anything else, which is understandable given that’s the software most people work on. The app can insert and edit 160 shapes from MS Office, 25 table styles (for Word), and supports movie clips and 37 different screen transition effects (for presentations). The spreadsheet app also has a custom keypad that makes it easier to operate. Currently, the mobile office suite can edit Doc, DocX, Xls, XlsX, Ppt, PptX and Txt files, and it can view PDF and HWP. The focus is on being as good as PC software, so it comes with a total of 500 editing features compatible with Microsoft Office, 170+ shapes, numbers of styled tables, and several templates. And like the best free and low-cost Office alternatives 9 of the Best Free and Low-Cost Alternatives to Microsoft Office 9 of the Best Free and Low-Cost Alternatives to Microsoft Office Microsoft Office has dominated the market of text documents, spreadsheets and slide shows for years, and for good reason – it’s one of the very best. However, there’s one drawback and that is the price.... Read More , it keeps you backed up with the auto-save function. Polaris Office 5 also works with a variety of cloud services, like Dropbox, Google Drive and more. Of course, Google has its own QuickOffice app available for free QuickOffice Goes Free On Android & iOS, Offers 10GB Extra Google Drive Storage QuickOffice Goes Free On Android & iOS, Offers 10GB Extra Google Drive Storage Google previously made QuickOffice free for Google Apps for Business customers, but now the office productivity suite is free for anyone on both Android and iOS devices. Read More , so it’ll be interesting to see how Polaris Office matches up to that, given it’s a paid app. Polaris Office 5 is available for $12.99 for a limited period discount, after which it will go back to its full price of $19.99. Current users of Polaris Office can upgrade for free. An Android app is not out yet, but should be soon as there are already screenshots of it on the Polaris website.